The Mandala Center has a main building with a dining area, library, gift shop, meeting rooms, and decks. There are two guest lodges. The Wolf Lodge has 8 rooms with two twin beds each and private baths along with a large common area. The Deer Lodge has 4 rooms in two suites with shared baths. 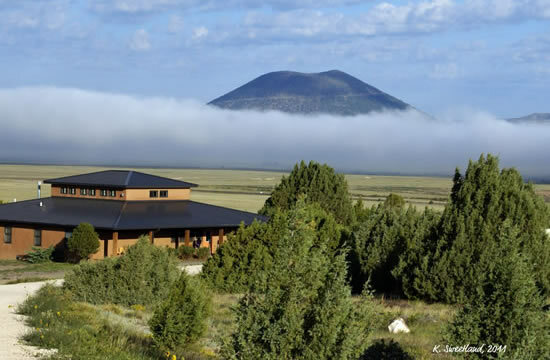 The Mandala Center, a non-profit retreat facility providing personalized service, comfortable accommodations, and heartfelt hospitality in the remote and beautiful setting of Northeastern New Mexico. The Mandala Center was born from a vision. In a lifetime of spiritual seeking, illness, and a thousand good deeds improving the lives of others, Tish Hewitt, then in her sixties in the mid 80’s, was still searching for the next assignment in life. Tish Hewitt discovered the land that now is home to The Mandala Center after having a vision of two mountains that seemed very important to her. During a road trip she discovered her vision was real when she came upon the Sierra Grande and Capulin Volcano – the two mountains she was shown. Tish felt a calling to settle here and purchase land and the ranch, right between the two mountains, just happened to be for sale . Tish Hewitt began construction of our buildings as a personal retreat home and she felt lead to include round walls and rooms. Tish asked her daughter, “Why am I making round walls?” Anna replied, “You are building your own Mandala of healing and wholeness.” Tish named the main building Casa Mandala. Tish, who seemed to sense she would never live in the Casa Mandala, passed away before her retreat home was complete. After her passing, Anna, her daughter, decided to move across country to take care of the ranch and the land her mother loved. After much reflection, Anna felt called to turn Casa Mandala into The Mandala Center and open up this special place to the public as a retreat center for those who are in search of rest, renewal, healing, and deeper understanding of life’s journey. In 1996 The Mandala Center came into being. We offer a variety of workshops and provide rental space for groups seeking time and study for spiritual growth, personal and professional development, health and wellness, and creative expression. For those seeking retreat for personal rest and reflection please contact us to inquire about availability. The Mandala Center...the perfect place to reflect, renew, rejoice!